On the thicker cuts of the chicken leg, make half slits to level the whole piece of meat. Season chicken with salt and place on a piece of cling wrap. Place 2slices of ginger and 1 stalk of spring onion with each piece of chicken. Roll up and tie both ends of the plastic securely. Double wrap with aluminum foil and steam chicken for 20minutes. Allow chicken to cool completely before chilling overnight in fridge. Slice the chilled chicken rolls and arrange on serving plate. In a juicy cup blender, combine ingredients for granita and process untill well blended. Spoon the blended mix on the chicken rolls and serve with wine soaked wolfberries. In a heated sauce pan, sauté the onions and garlic with butter. 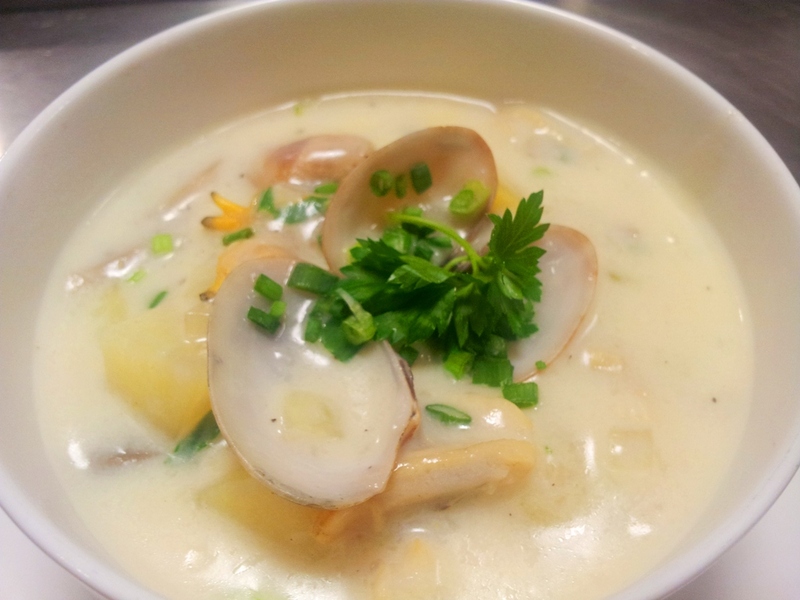 Add the chopped celery, potatoes and mushrooms and cook for 1minute.Add in the clams and cook for two minutes. Pour in milk, water and potatoes. Bring to the boil and reduce heat to simmer for 15 minutes. Add in the clam meat, green peas and cream. Adjust the seasonings with concentrated stock. Thicken the soup with some cornstarch and pour in the white wine. Transfer to 4 serving bowls and serve with chopped parsley and spring onions. Dear Chef Eric, Thank you for your recipes. Have a good week. Dear Chef Eric, thank you for your yummy recipes. Keep up the good work.